This naïve and charming provincial portrait is reputed through provenance to represent two young children from the Courtenay family, a large and distinguished West Country family of great antiquity. However, there is an absence of any coat of arms to aid a precise identification of these two children which is problematic as the Courtenays were a large, diffuse family with extensive properties throughout Devon, Cornwall and Ireland. In addition, much of this property was dispersed through marriage to other branches of the family based in Devon, Cornwall and Ireland, in particular amongst the Mohuns, Arundells, Tretherffes, and Trelawnys, and their descendants. Therefore, the identification of the two young sitters becomes an educated guess based on comparison of all the dates of births of every branch of the Courtenay family. Two members of the family appear to fit the date and age inscribed on the painting, that is, Anne Courtenay (b.1630) and her sister Susan (b.1632). Their parents were Peter Courtenay of Penkevell, Cornwall (b.1584) and Amye Trehane. Anne Courtenay married first in 1650, Sir Peter Courtenay of Trethurfe, Cornwall and secondly, Sir Peter Fortescue of Wood, Devon. By descent within the Courtenay family. Our double portrait of the children has an unusual composition as they are painted half-length within double faux stone ovals. Both children are dressed in similar costumes consisting of matching red bodices and skirts with white linen aprons, which in the case of the baby is edged in needlepoint lace. Their flat collars are also decorated with a combination of cutwork and needlepoint lace, while the cuffs are finished in very fine needlepoint lace. There are subtle differences in the costumes, for example, while both children wear little caps trimmed with lace that fits their heads snugly, the baby also wears a more ornate lace trimmed headdress over this cap and pretty black bows on her sleeves whilst her elder sibling’s costume is richly decorated with gold braiding. The House of Courtenay was an important dynasty in medieval France originating from the castle of Courtenay in the Gâtinais (Loiret), dating back to the 10th century. In the mid-12th century a branch of the family settled in England, and were granted the barony of Okehampton and inherited the title of Earls of Devon (in 1293) from the de Redvers family. The main branch of the family still own Powderham Castle, Devon and the current head of the family is Hugh Courtenay, 18th Earl of Devon. E.A. Cleveland, A Genealogical History of the Noble & Illustrious Family of Courtenay, Exeter, 1735. M. Cherry, The Courtenay Earls of Devon: the formation and disintegration of a late aristocratic affinity, Southern History 1, 1979, pp. 71-97. In the 16th and 17th century many children learned to read and write with something called a hornbook. It was not a book in the modern sense but was a wooden board with a handle. Fixed to the board was a sheet of paper with the alphabet and the Lord's prayer (the Our Father) written on it. The paper was usually protected by a thin slice of animal horn. J.B. Bedaux and R. Ekkart, Pride and Joy. 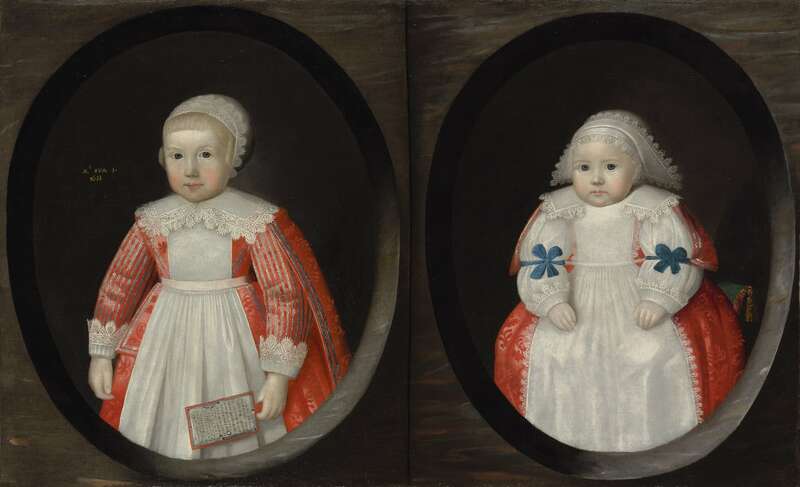 Children’s Portraits in the Netherlands 1500 – 1700. Amsterdam: Ludion Press Ghent, 2000.